At one time, this quaint bed and breakfast struggled to make ends meet. With its out-of-the-way location and limited accommodations, the previous owners nearly went bankrupt trying to keep the place up and running. However, the property recently changed hands, and under the careful guidance of its new owners this old manor was given a new purpose in life. Weddings! 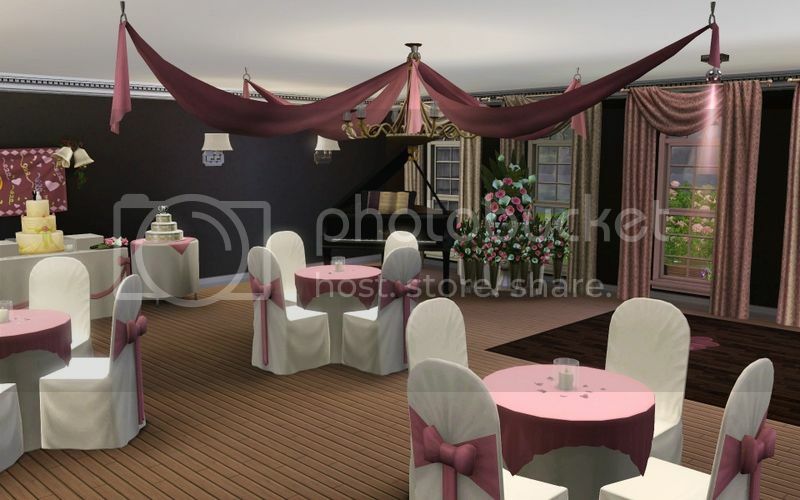 Half of the downstairs was transformed into a spacious ceremony room with seating for up to twenty guests. The lovely old bay window behind the wedding arch offers a stunning backdrop for the vow exchange, and on the other side of the room there is a traditional upright piano ready to serenade the bride as she walks down the aisle. The other half of the first floor is taken up by the ballroom. Luxurious linens, decadent flowers, and bountiful bows adorn all the tables and chairs, and both the ceiling and walls are draped in fine silk fabric. 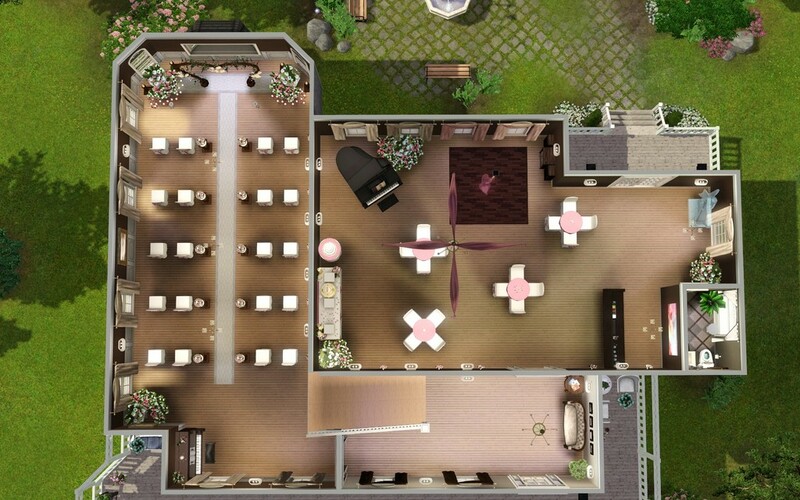 Ready made for a reception, this space comes equipped with a bar (Late Night style), a dance floor, a grand piano, a buffet table, and a wedding cake. Upstairs, there are four guest bedrooms including a bridal suite and groom's room, each with their own en suite bathroom. The entire inn has been recently remodeled from top to bottom in keeping with a traditional style representative of the manor's history, and while the bathrooms are fresh and modern the hotel's furnishings are mostly antiques from a bygone era. 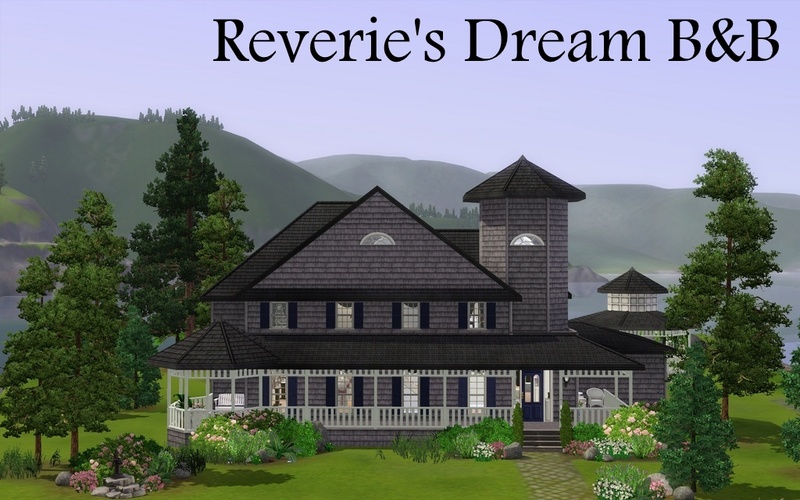 Outside, the Reverie's Dream B&B offers an alternate place to exchange vows. The old gazebo in the back has been updated with a wedding arch and seating for up to twelve guests. Perfect for smaller wedding parties! 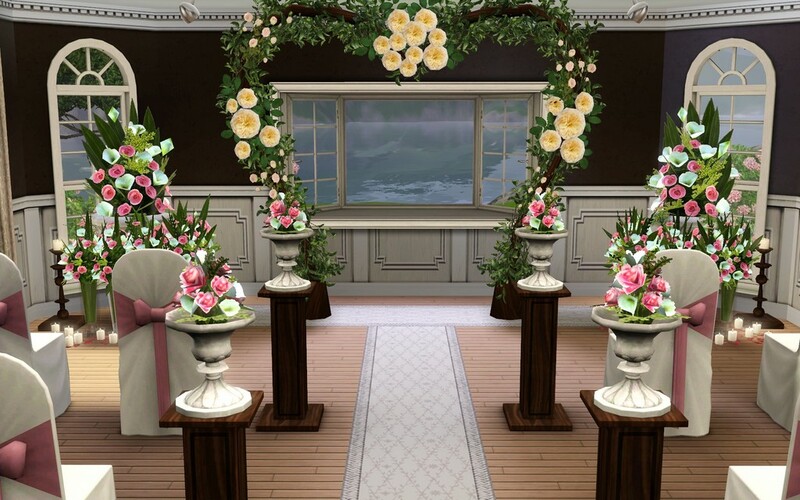 Fully Decorated and Ready for a Wedding! Fast Lane- Not required. I used one, small decorative item from Fast Lane, the "debonair decanter". It's in the groom's suite on the dresser by the door to the balcony. 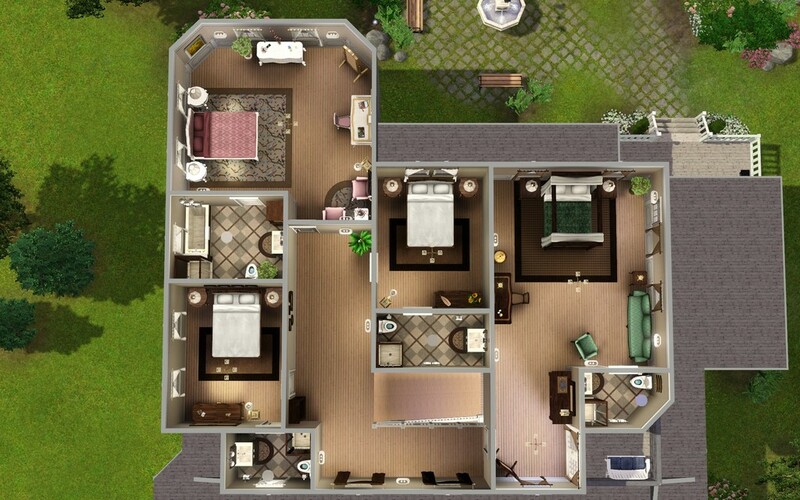 Master Suite- This pack is required. 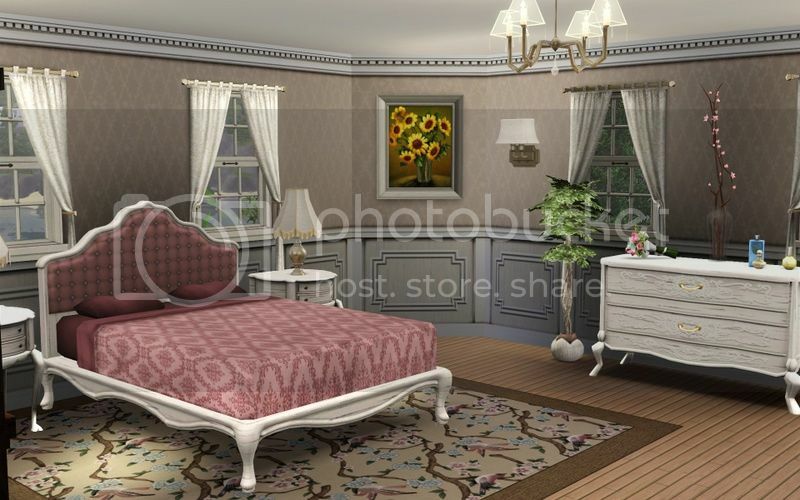 I used several decorative items from Master Suite, and the bathrooms are almost completely furnished with this set. If you don't have it, the lot will require quite a bit of repair. 3 New Porch Fences by Flabaliki. Required. These fences make up the porch railings and gazebo. Traditional Piano by armiel. Required. It just looks so nice. Curtain Height Adjustment by granthes. 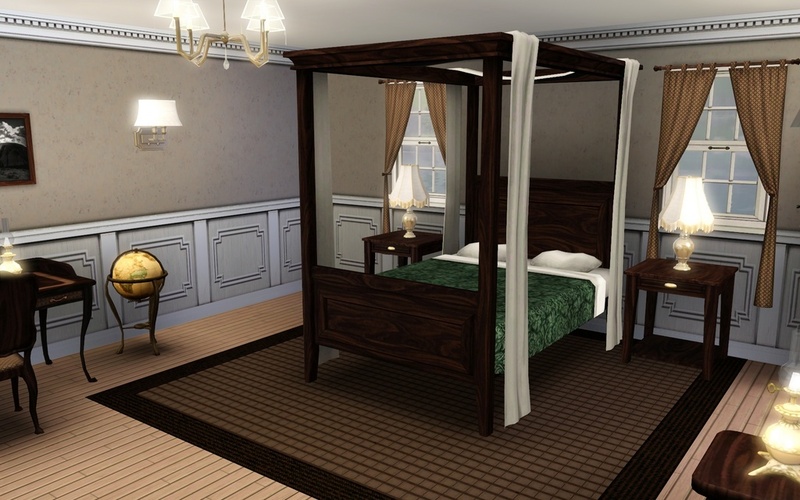 Not required, but a couple of the curtains may pop back into their original position if you don't have this mod. Altered Plants by HystericalParoxysm. Not required. 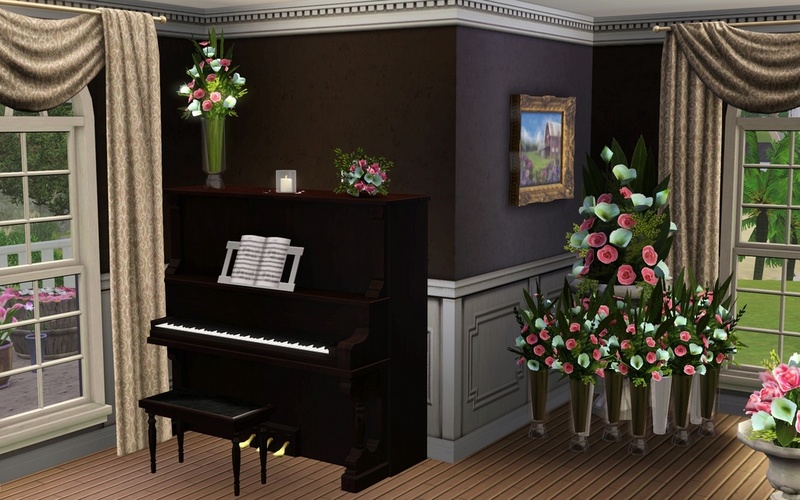 It just makes EA's plants and flowers appear less neon. Larger Decorative Magazines- Default Replacement by Menaceman44. Not required. It makes the magazines appear larger/more realistic. 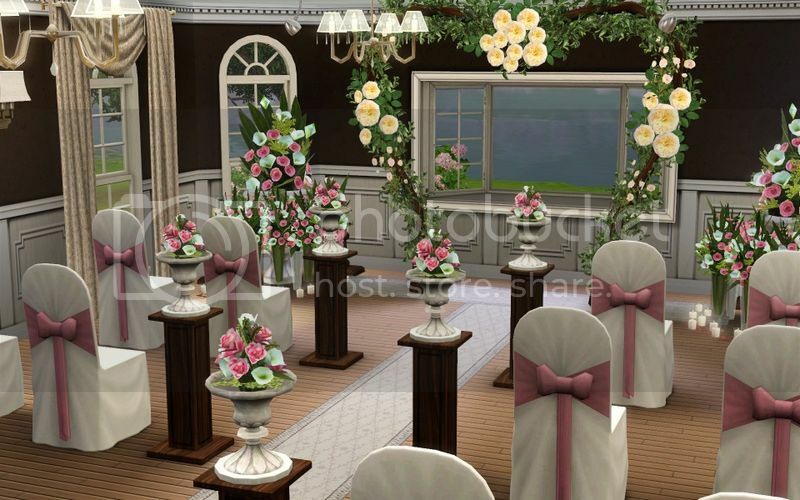 This lot pretty much requires the Romanza Ceremony + Reception set from the store. I used several items from this set, and if you don't have most of them it will not look right. If the item is marked with a double asterisk (**), it is required. The rest is purely decorative. I zoned the lot as an exclusive lounge, but any assignment should work. 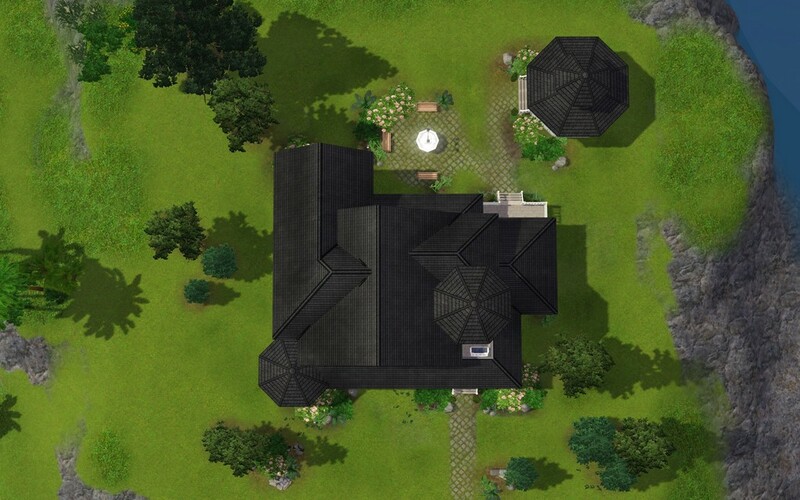 You can change it in edit town mode, and it shouldn't have any affect on the lot. 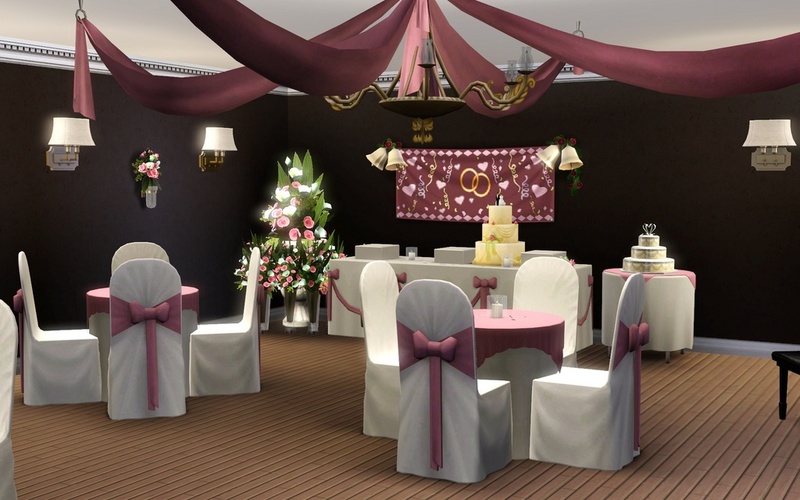 I recommend setting the gobo in the ballroom to the hearts pattern with a custom color. I like pink, code 207, 77, 121. 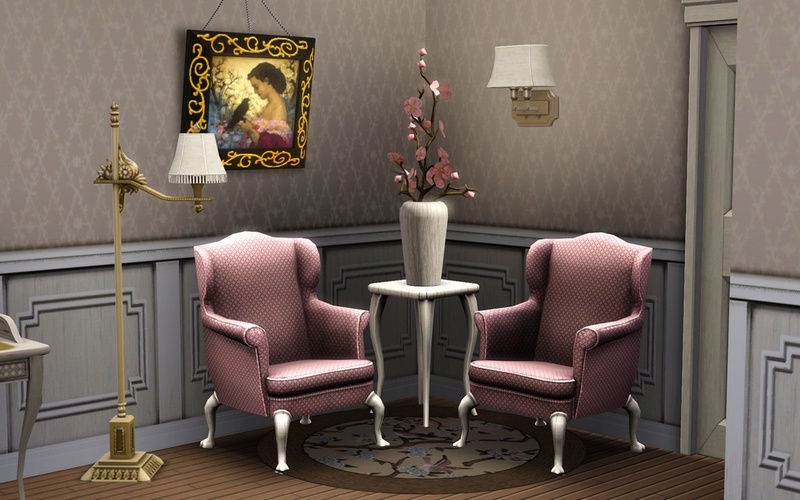 It matches up well with the rest of the decor, but any shade of hot pink should work nicely. Also, all the lights are set at a custom intensity and color to give the lot a nice ambiance at night, so just be careful if you play around with the lighting. 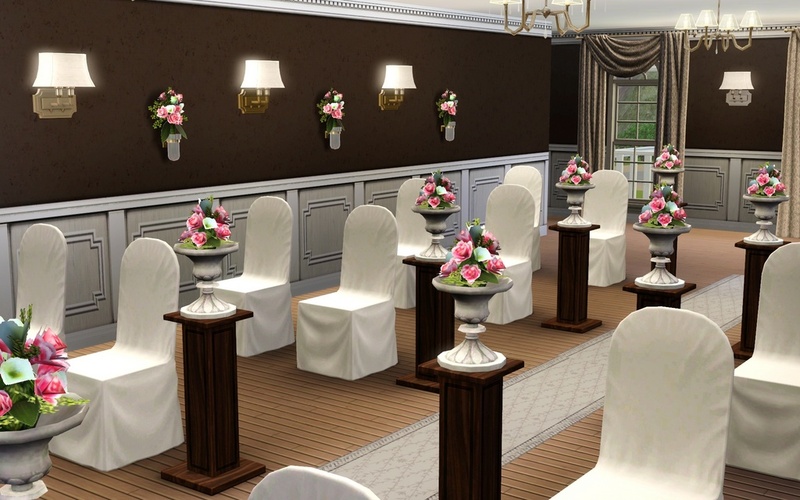 Oh, and I like to turn the candles on the tables in reception hall off because they make the white chairs glow too much, but that's totally your call. A big thank you to all the people who gave me feedback in CFF. 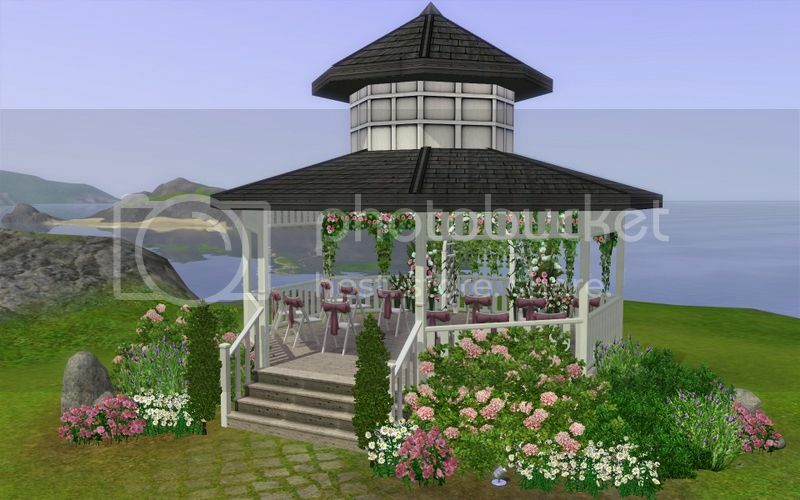 Especially Elexis for the gazebo idea, karen lorraine for the idea to turn it into another venue, Riptide651 for help with the exterior, and heaven for the moral support and encouraging words!